“Three Questions …” is an American Red Cross in Greater New York blog series featuring staff, volunteers, and partners who help carry out our humanitarian mission. Through these short interviews, we hope to shine a light on our different programs and get to know those who make this work possible. 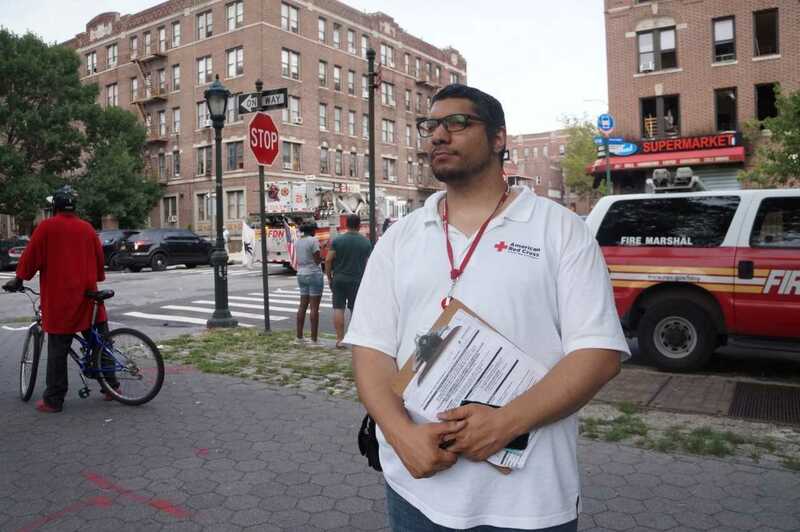 Francisco Resto is a longtime member of the American Red Cross disaster services team. Resto joined the organization 11 years ago as an Emergency Communications Center dispatcher and currently serves as a disaster responder. In this role he goes to the scene of fires, floods, vacates, building collapses, and other emergencies across all five boroughs where he delivers emergency humanitarian relief to affected residents. And what makes Resto’s already-unique job even more so are his work hours: 10:00 P.M. to 6:30 A.M. Along with his full-time job with the Red Cross, Resto is also a full-time student. We recently caught up with him for a quick chat to learn about what it is like taking on this important role in the middle of the night. Often the residents you are helping are woken up by some kind of disaster. How do people react to seeing the Red Cross in the middle of the night? I usually get comments like, “Its three in the morning, and you guys are here? !” Having someone present at all times of day is in and of itself comforting. We let people know that we’re here to help and here to guide. Our presence, often unexpected, means a lot. A lot of people consider NYC the City that never sleeps. Do you have a different perspective on the City now that you are responding in the middle of night, a different perspective than if you were responding during the day? The City feels so small at night. The reason why I say that is because, yes, New York is a large city; it’s very dense, but at night there are so few people on the streets so you can get anywhere in 20 minutes. Even if it’s the northern most part of the Bronx or Far Rockaway, you can get anywhere pretty fast. This means a lot when you are heading to help a family who really needs the assistance. Is there a memory of a particular family you have helped on your night shift that has stuck with you? It is difficult to remember one particular family since I respond to incidents on an almost nightly basis, but I do remember a night shift about ten months ago in the middle of the cold winter: a 5-alarm fire in the Bronx displacing an entire building with roughly 60 units. Most of the clients had alternative means of housing and did not need Red Cross assistance, which is a great thing, but we did end up housing roughly ten large families. I remember arriving on scene and trying to navigate and evaluate the chaotic fire scene. There were faces in the crowd that just couldn’t believe a fire could happen to them in the cold of winter at almost 11 at night. Most of the clients we assisted were huddled inside a typical Bronx Bodega just across the street from the fire building.The cold winter air, the frozen water on the ground, and the grief of losing a home, I knew I needed to help get a better place for them to gather. After working to secure an MTA bus I approached the group, quickly announced my name, the organization I represented, and informed the clients we have a bus on the scene to keep everyone warm and safe, and we would immediately begin the process for those who need a place to stay for the night that was warm and dry. We assisted the families present with housing, financial assistance, and all the necessary mass care items needed at the time in record time, closing out the incident in roughly 2-3 hours.